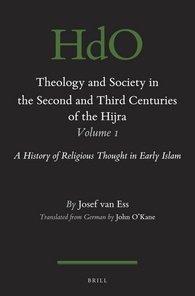 Josef van Ess, Emeritus Professor of Islamic Studies and Semitic Languages, University of Tübingen, Germany, has published widely on the History of the Islamic World ; Islamic theology and philosophy, especially with respect to the formative period (8th-10th centuries) and the age of the Mongol conquests (13th-14th centuries) ; and Islamic mysticism. His most famous work and is Theologie und Gesellschaft in 6 volumes (de Gruyter 1991-97), the first four volumes of which are now being published in English by Brill. Titre initial : "Theologie und Gesellschaft im 2. und 3. Jahrhundert Hidschra : eine Geschichte des religiösen Denkens im frühen Islam. Band I", Walter de Gruyter, 1991. Theology and Society is the most comprehensive study of Islamic intellectual and religious history, focusing on Muslim theology. With its emphasis on the eighth and ninth centuries CE, it remains the most detailed prosopographical study of the early phase of the formation of Islam. Originally published in German between 1991 and 1995, Theology and Society is a monument of scholarship and a unique scholarly enterprise which has stood the test of the time as an unparalleled reference work.